Ever since Arsene Wenger unearthed him in 1988, George Weah was considered the proto-type of the modern striker. Despite not scoring as much as some of his peers, Weah influ-enced the game by operating outside the penalty area and making life tougher for opposing defenders. He was most often lauded for his pace, stamina, technical ability, and brilliant at-tacking instincts. George Weah in his first year in Milan. After starting his senior career playing for his hometown clubs in Liberia, Weah moved to a Cameroonian side called Tonnerre Yaounde. That’s where he caught the eye of Claude Le Roy, then-coach of the Cameroon national team. Le Roy was so impressed by the youngster that he contacted Arsene Wenger, who flew to Africa to see Weah in person. Soon thereafter, the two sides reached an agreement, and Wenger brought Weah to Monaco. Under Wenger’s tutelage, Weah blossomed into a clinical and prolific striker. During his four seasons with Monaco, he won the Coupe de France in 1991 and was named African Footballer of the Year in 1989. Weah still credits Wenger as one of the most important influences in his life and career. In 1992, Weah moved to Paris Saint-Germain, where he won two more Coupe de France titles (1993, 1995) and the French League in 1994. He also led his team to the 1994/95 Champions League semi-finals, becoming the top scorer of the competition with 7 goals. One of those goals -- against Bayern in the group stage -- was nothing short of spectacular, as Weah dribbled past the entire opposing defense and scored from just inside the penalty box. 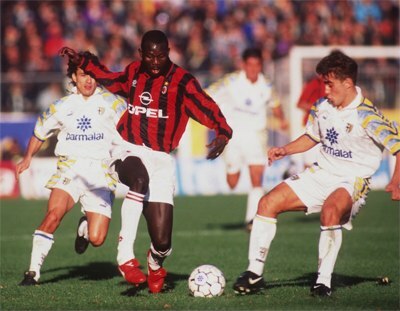 In 1995, Weah moved to AC Milan, where he quickly formed a successful partnership with Roberto Baggio and Dejan Savicevic. In his very first season with Milan, he emerged as the club’s top goalscorer, leading them to a Serie A title. For his achievements with both Paris Saint-Germain and Milan in 1995, Weah won the Ballon d’Or. To this day, he’s the only native African player to win this prestigious award. Weah continued to play for Milan until 2000, winning another Serie A title in 1999. During most of his tenure with Milan, he was considered to be the club’s biggest star, successfully filling the void left by the departure of Marco van Basten. At his peak, his deadly finishing skills and powerful physique contributed to him becoming one of the best strikers in the world. After leaving Milan in 2000, Weah moved to England. After two relatively unsuccessful stints with Chelsea and Manchester City, he played for Marseille and Al Jazira before finishing his playing career in 2003. In 2004, Pele honored him by naming him into his FIFA 100 list of the greatest living players in the world. Despite his successful club career and undeniable footballing ability, Weah never managed to make much of an impact with his national team of Liberia. During his time with the team, Liberia managed to qualify for the African Cup of Nations in 1996 and 2002. On both occasions, they were eliminated in the group stage. These days, Weah is considered one of the best players to have never played in the World Cup.